Ahem, pardon my Disney. As I promised before, if you stick with me I’ll guide you to the cream of the kdrama crop. Today I’m starting a series where I’ll overview the best kdramas (so you’ll see a lot of familiar titles from my earlier post); by the end of each article you should know whether or not the individual show is one you’d like to see. There’s no better place to start than City Hunter. It’s the ideal gateway drug to drama land, because it’s got a little bit of something for everybody. If your primary reason for exploring kdramas is to get your daily dose of fluff (as it usually is for me) then you’ll want the romantic comedies, which I’ll start looking at next. But you should seriously still try City Hunter (available on Hulu and Netflix Instant). Its virtues are many, and one of them is the serious cute between the two leads. Lee Yoon Sung: Our hero, the City Hunter. He has been raised from infancy to exact revenge on the men responsible for his father’s death. In the process he champions the poor and disenfranchised. Kim Na Na: The doe-eyed leading lady, but don’t let that fool you: she can pack a punch. She was just accepted into the Presidential Secret Service, which is how she separately meets Lee Yoon Sung both as himself and as the City Hunter. Lee Jin Pyo: Our complex villain. The dude’s gone crazy with his revenge scheme, but he seems to genuinely love Yoon Sung. He’s grandiose about his plans; I seriously expect him to go all Loki and start spouting off lines about his glorious purpose. Kim Young Joo: The idealist young lawyer working as a Seoul city prosecutor. He has the same endgame as the City Hunter, to bring corrupt politicians to justice, but he wants to do it by the book. He’s also after the City Hunter for working outside the law. Lee Kyung Hee: Yoon Sung’s distraught mother. City Hunter opens with a literal bang: the real-life Rangoon Bombing, the 1983 assassination attempt on the South Korean president while he was on a state visit to Burma. Within the world of the show, at the moment of the bombing, back in South Korea, the wife of one of the President’s bodyguards is in labor. Her husband, Mu Yeol, only gets to meet his son once before he’s sent off with his best friend Lee Jin Pyo and 19 other men in a secret punitive mission against North Korea, which the South blames for the bombing. While they’re there the five officials who sent them bow to international pressure and decide they need to cover up the mission. So they make a horrible decision, one they plan to take to their graves: they issue an execution order for the 21-man strike team. The entire team is gunned down by their fellow soldiers as they attempt to return from their mission. All, that is, except Jin Pyo. 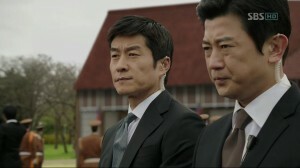 Mu Yeol dies to save him, covering Jin Pyo’s body with his own and making Jin Pyo vow to look after his wife and infant son. Jin Pyo is consumed with revenge and instantly begins plotting an elaborate and thorough plan to take down the men who betrayed him. His primary weapon is the newborn child.